Luca Giordano (1634–1705), Aeneas and Turnus (date not known), oil on canvas, 176 × 236 cm, Palazzo Corsini al Parione, Florence, Italy. Wikimedia Commons. In Ovid’s Metamorphoses, Achaemenides and Macareus have been telling stories from the Odyssey. With those complete, Aeneas (hero of Virgil’s Aeneid) moves on to found Alba, the precursor to Rome itself. When Macareus had completed his narrative, Aeneas’ nurse was buried there in a marble sepulchre. Aeneas and his crew then set sail on the final leg of their journey from Troy to Latium. Once they had arrived, Aeneas and his former Trojans had to fight Turnus, king of the Rutuli, for Latinus’ throne and the hand of Lavinia in marriage. This proved a long and bitter struggle, in which Aeneas was aided by others. Among those who refused to assist him was Diomede, in Apulia. were Lycus, Abas, Nycteus and Rhexenor. And, while they stared, they took his feathered shape. our oars with flapping of new-fashioned wings. they were like snowy swans, though not the same. Acmon and his friends were thus transformed into white seabirds. Aeneas’ envoy to Diomede, Venulus, also saw a grotto where a shepherd had offended Pan, and been turned into an oleaster tree. Turnus, for I will save this burning fleet. prow foremost, plunged them underneath the wave. to soft hair, and the sail yards changed to arms. The azure color of the ships remained. with every influence of birth forgot. That was a reverse of the normal type of transformation, with inanimate ships being changed to sea-nymphs. When Turnus was killed by Aeneas, so the city of Ardea fell, and from its ashes and ruins arose a bird, the heron. nodded consent with calm, approving face. with quiet current into Neptune’s realm. thereby transforming him into a god. the new god Indiges, and honored him. Ovid then lists the successor rulers of Latium and Alba, which had been founded by Aeneas, up to the reign of King Proca, in which his next story is set. Whether viewed from the final books of Virgil’s Aeneid or Ovid’s retelling at the end of his Metamorphoses, the adventures of Aeneas in Italy have been painted very seldom indeed, although his apotheosis to a god has been more popular. 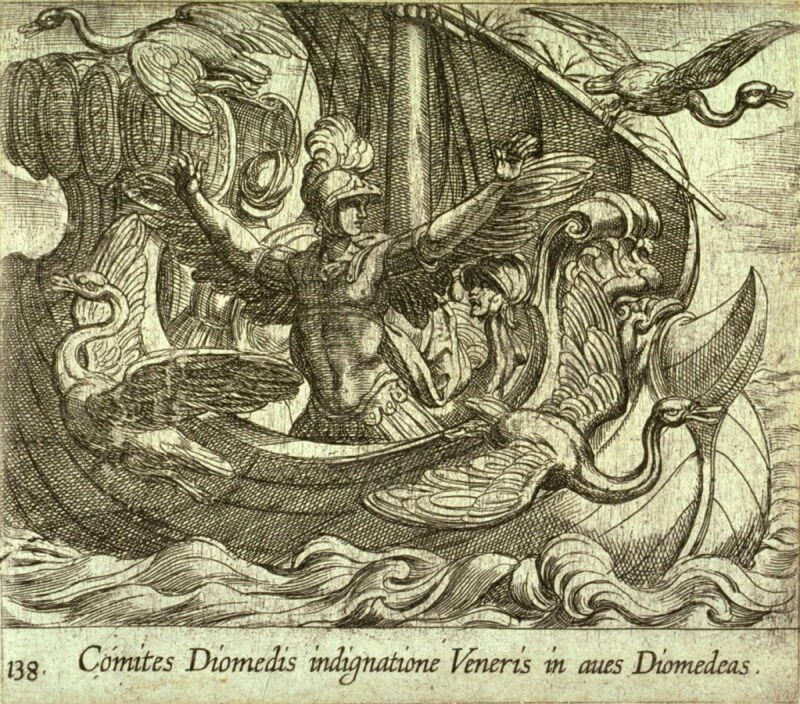 Antonio Tempesta (1555-1630), Acmon and his Friends Changed into Birds by Venus (date not known), etching in illustrated edition of Ovid’s Metamorphoses, Book XIV, 10.3 x 11.7 cm, location not known. Wikimedia Commons. Antonio Tempesta’s etching of Acmon and his Friends Changed into Birds by Venus from about 1600 is the only pictorial representation which I have been able to find of that story told by Diomede, and for its period it tells it well. Artist not known, Trojan Ships turned into Nymphs (c 400), Vergilius Vaticanus, Aeneid Book IX, illumination on parchment, 21.9 × 19.6 cm, Biblioteca Apostolica Vaticana, The Vatican. Wikimedia Commons. 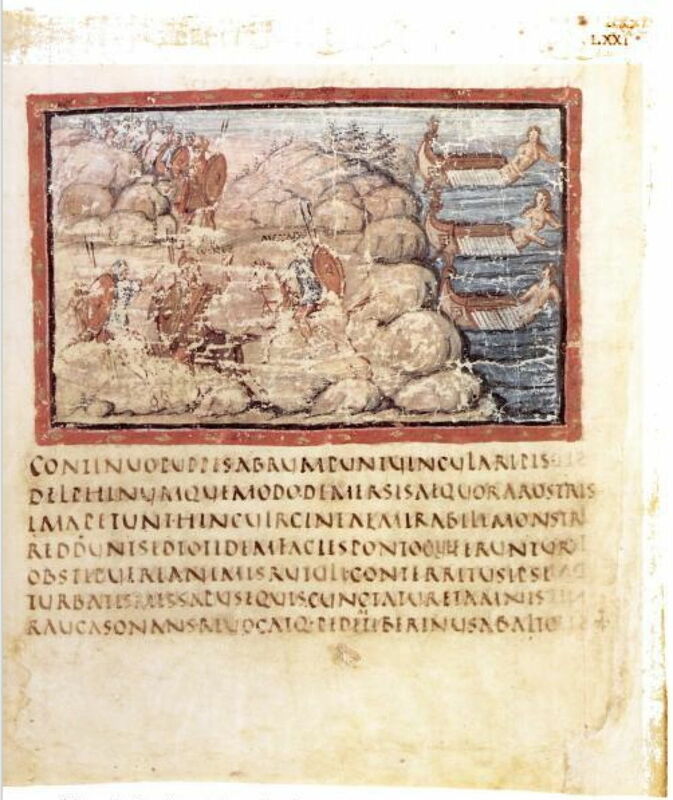 The single illustration that I have been able to find of the transformation of the burning Trojan ships into nymphs comes from one of the most precious documents featured in this series: the Vergilius Vaticanus manuscript of Virgil’s works dating back to about 400 CE. Three ships are seen already transformed into the head, arm, and body of nymphs at the far right, although there is no sign of any fire or hailstorm. The left and centre show Aeneas fighting Turnus. The Vergilius Vaticanus is very special, as one of the oldest surviving sources for the text of the Aeneid, and one of only three ancient illustrated manuscripts containing classical literary works. At one time, it belonged to Pietro Bembo, an Italian scholar who is commemorated in the font name. 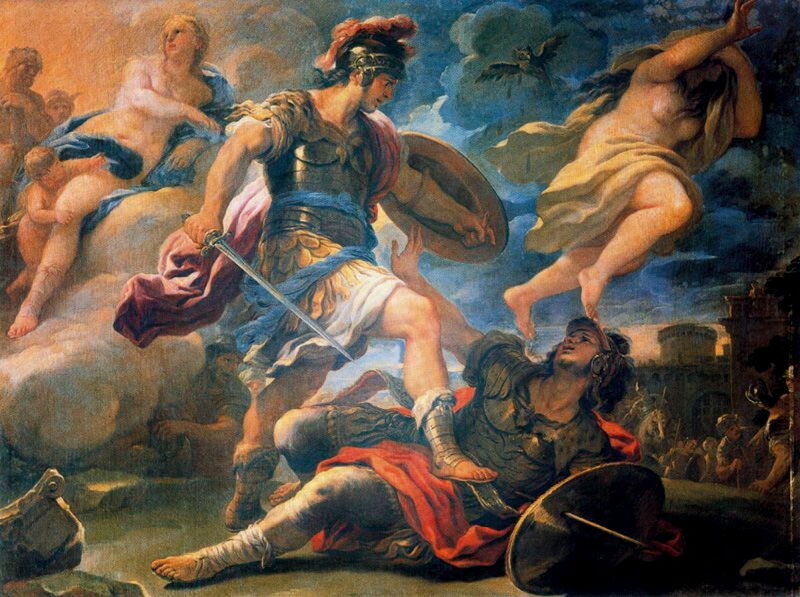 Luca Giordano’s Aeneas and Turnus from the late 1600s is one of the few paintings showing the battle between Aeneas and Turnus. The Trojan hero here has Turnus on the ground, under his right foot. At the lower left is one of Aeneas’ ships, which has not been transformed into a nymph. Venus, Aeneas’ mother, and Cupid, his half-brother, are at the upper left, and the goddess at the upper right is either Minerva (with her owl), or Juno – as losers in the Judgement of Paris, both bore a grudge against the Trojans. Of the more numerous paintings of the apotheosis of Aeneas, I have chosen two. Peter Candid (c 1548–1628), Aeneas Taken to Olympus by Venus (date not known), media and dimensions not known, Kaiser-Friedrich-Museums-Verein, Berlin, Germany. Wikimedia Commons. Peter Candid’s Aeneas Taken to Olympus by Venus from around 1600 shows Venus at the right, in her chariot with Cupid, anointing Aeneas, on the left, with nectar and ambrosia. Above them is the pantheon, arrayed in an imposing semicircle, and above them Jupiter himself, clutching his thunderbolts and ready to receive the new god. 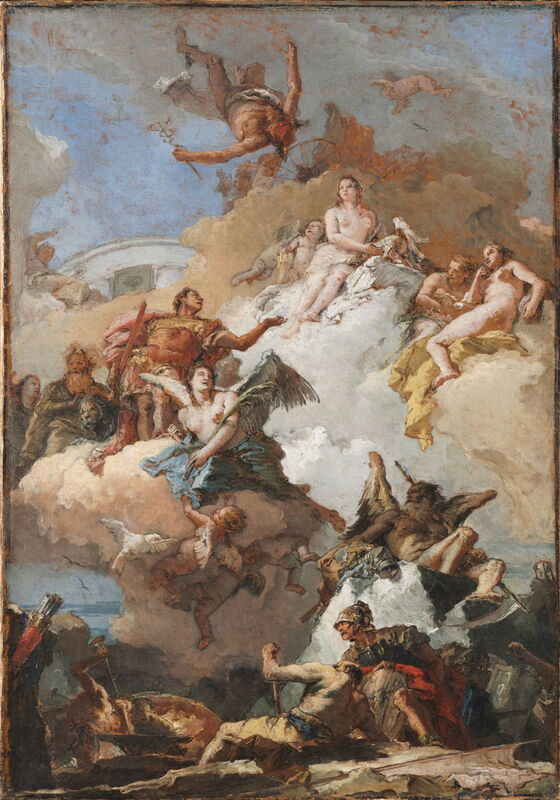 Giovanni Battista Tiepolo (1696-1770), The Apotheosis of Aeneas (sketch) (c 1765), oil on canvas, 72.2 x 51.1 cm, Harvard Art Museums/Fogg Museum (Allston Burr Bequest Fund), Cambridge, MA. Courtesy of Harvard Art Museums/Fogg Museum. Tiepolo’s sketch for a fresco ceiling in the Royal Palace in Madrid, The Apotheosis of Aeneas from about 1765, is another impressive account. The artist made this a little more elaborate by combining the apotheosis with the presentation of arms to Aeneas by his mother Venus. Aeneas is to the left of centre, dressed in prominent and earthly red. 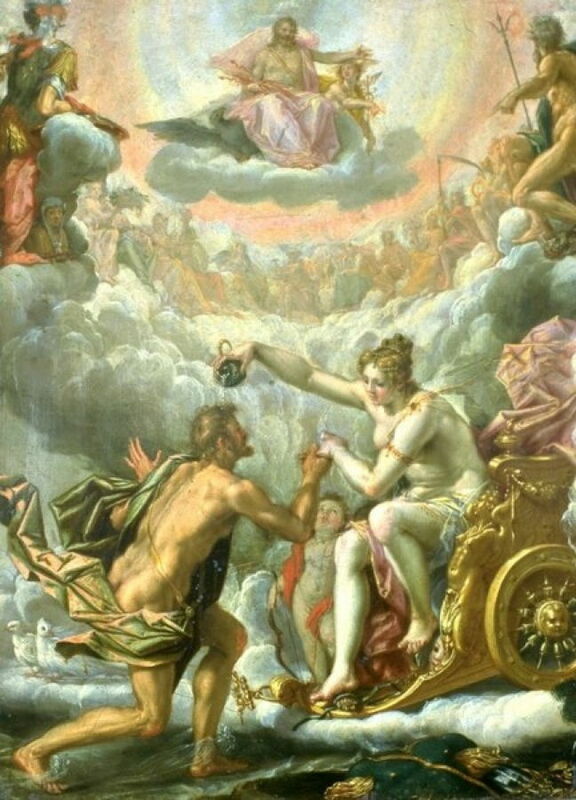 Above and to the right of him is his mother, Venus, dressed in white, ready to present the arms which have been forged for him by Vulcan, her partner, who is shown below supervising their fabrication. Aeneas’ destination is the Temple of Immortality, glimpsed above and to the left of him, through a break in the divine clouds. With Aeneas turned into the Roman god Indiges, Ovid moves on with the story of the foundation of the city of Rome. Posted in General, Language, Life, Painting and tagged Candid, Giordano, Metamorphoses, myth, narrative, Ovid, painting, Tempesta, Tiepolo. Bookmark the permalink.